I might have spoken too soon when I said I was feeling better, so let’s just do Karmic Balancing gifts and try not to think about it. I’m taking today and knitting a sock, and working on catching up on paperwork, and trying to put my business to bed for the week that I’ll (hopefully) be away, and I’m trying not to whine. Thanks for the donations my petals, you guys are so amazing that I’ve now met my public goal – I’m looking now to blow it out of the water. Last year you guys took me way, way over my private and public goals, and I know that there’s no force out there like knitters. None. Every ding on my phone makes me feel a little better, and makes me more hopeful that this is going to be okay. Let’s hope that Karma works, and that trying to put something good out there does something good for how I feel. A miracle cure by tomorrow would be nice. 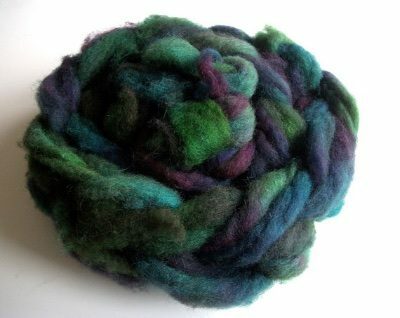 100 g of handdyed Shetland roving. 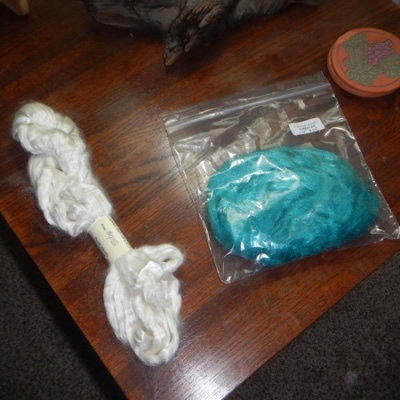 Dyed by Anne, and the fleece came from her friends’ flock. Comes with a handcrafted (again, made by Anne) orifice hook, of sterling silver, embellished with a handcrafted lampwork bead. 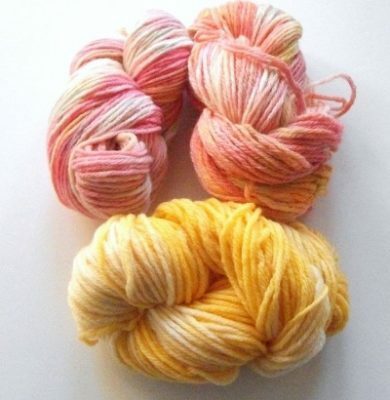 Anne also has 3 skeins of 100% merino worsted weight yarn. 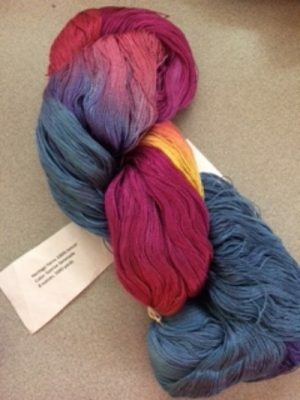 Dyed using food safe dyes. 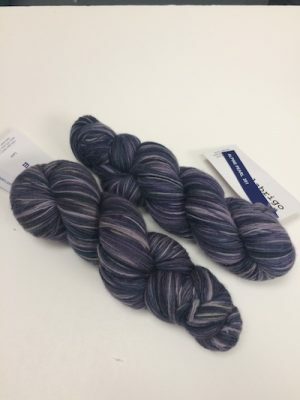 120 yards/skein, 1.75 oz, 50 grams, and she’ll be mailing those to Kay W..
Belinda went for a stash dive, and came up with these two beautiful skeins of Malabrigo Lace. Turns out they’re for Helen H. Enjoy! 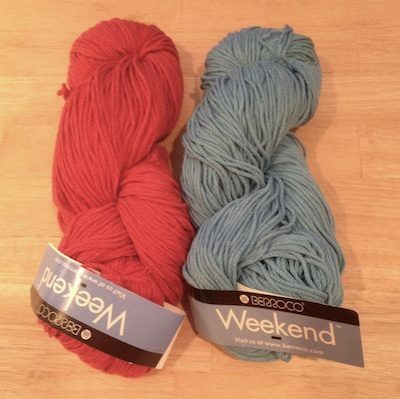 The Oswego NY Coffee Connection knitters would like to donate two skeins of Berroco Weekend in colors 5947 (salmon swimming upstream) and 5966 (blue sky in summer). They’ll be mailing it out to Peg L, and I hope she loves it. 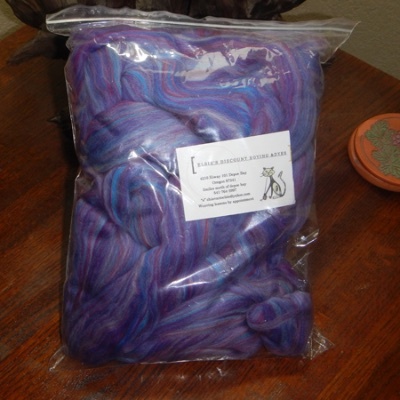 Helle has two beautiful skeins, going out into the world to make a little magic. Heritage Yarns 100% tencel, colour is Sunrise Serenade 8 ounces; 1680 yards for Donna G.
and Knitted Wit Worsted, 100% Super wash Merino, Colour: She Persisted (how appropriate) 4 ounces, 200 yards for Lisa B. Thank you Helle! 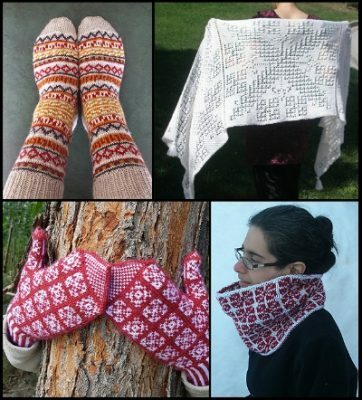 Our good friend Kathleen Sperling has three lovely gifts of e-book pattern collections. 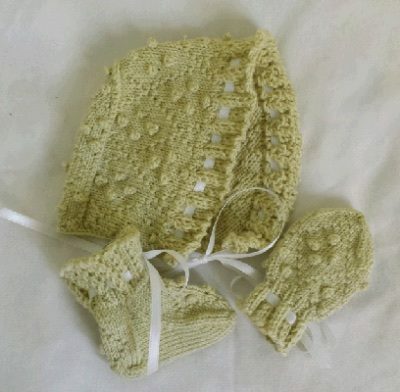 First, her blanket trilogy, consisting of Cervelli, Around the Block, and The Celtic Knotwork Baby Blanket. That’s for Donna B. Then an Accessories Quartet, that’s Dambrod, Balthazar’s Jumper Socks, Jianzhi cowl, and the Addis Abeba shawl. 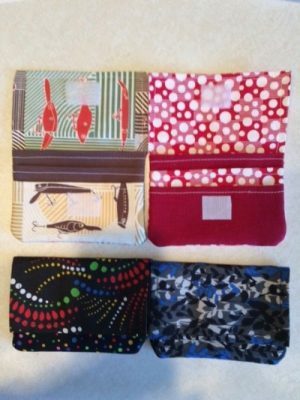 Those are going to Jessica R.
Last, but not least, she’ll be sending her Darling Layette eBook to Maggie B.
Tim has a set of four 3 X 4 1/2″ wonder wallets, each with five pockets. They are great for extra credit cards or cash or for giving gift cards. 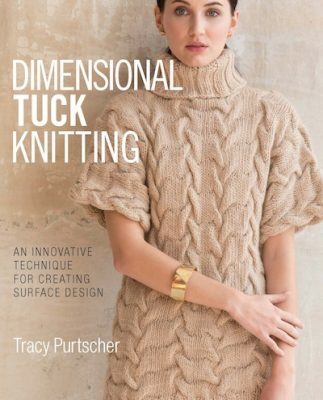 Those are going to Pippi S.
Next, a copy of a great new book from Tracy Purtscher, Dimensional Tuck Knitting. 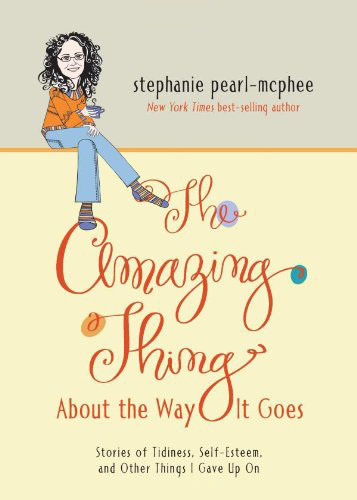 It’s not out until September, so there will be a tiny delay in getting it, but when Tracy H does, I hope she loves it. 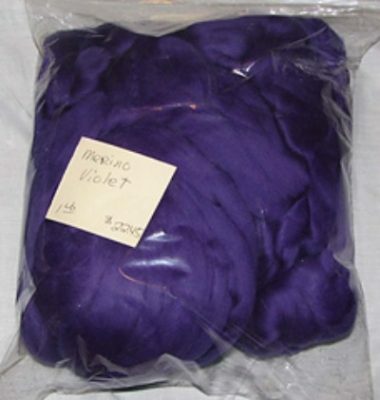 We’ve got a few from an amazing person who would like to be an anonymous Balancer, one 8oz bag of Elsie’s Discount Roving & Dyes “Amethyst”, and one in purple. 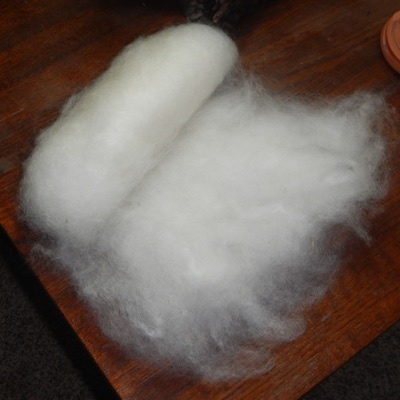 The secret Santa will be mailing those to Rhea K.
Our mystery person also has approximately 20 batts, each weighing about 40 grams, of a creamy white Finn-cross roving. Hand processed by Anonymous Balancer, those are for Robyn R.
She’s also parting with one 40 oz. 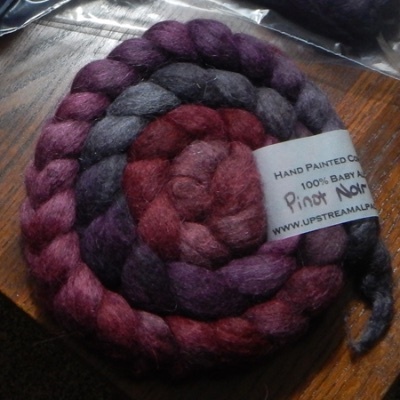 bundle of Plum Crazy Ranch Fiber Art Mulberry Silk Sliver, and one 1oz bundle of blue-green, hand-dyed Firestar, and mailing it to Linda L.
Last but not least, she’s somehow parting with THREE braids of Upstream Alpaca “Hand Painted Combed Top 100% Baby Alpaca” in “Pinot Noir” – 4 oz each braid. Those will be winging their way to Kelly M.
Emily has an amazing gift. 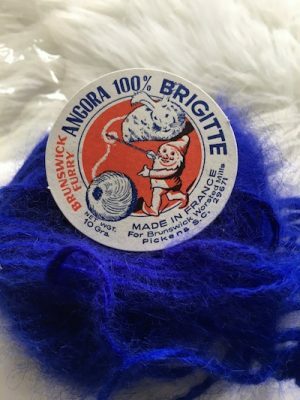 8 balls of gorgeous blue angora, in its original box. Emily says “It is old, though I don’t know by how; I received it from a fiber artist friend who is retiring and downsizing. Her only condition of giving it to me was that I “make something awesome”, and since you are doing that with PWA and the Rally, it only seems fitting.” I hope Holly W makes something awesome! 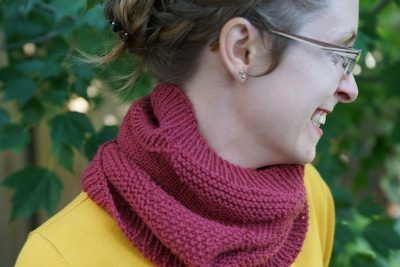 Karen Fletcher’s got a good one, TEN free copies of her pattern The Texture Block Cowl. 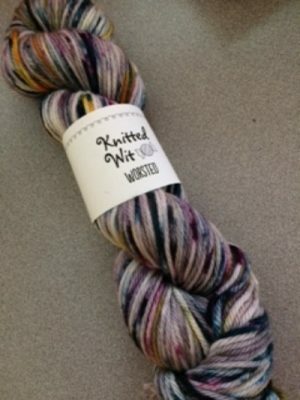 It’s a good one, takes a single skein of worsted weight yarn, and looks like a charming defense against the elements. (And a good Christmas present, if you’re in the mood.) 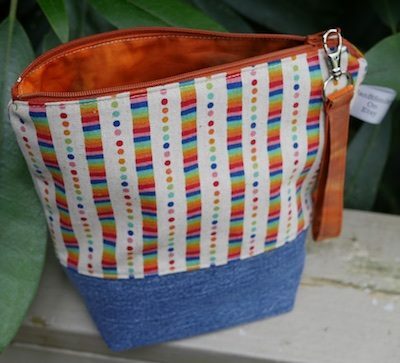 She’ll be sending those along to Kathleen R, Cherilyn P, Sarah R, Barbara J, Tara W, Jaime P, Beth W, Maggie H, Alicia R, and Belinda H.
Finally, a gorgeous “Rainbow is the new black” project bag from Jan Smiley. (Peek at her shop, it’s all lovely.) This bag is for Janis M, and I hope she loves it. Now, if you’ll all excuse me, I’m going to go lie down and wait for my miracle. I’m sure it’s on its way. Cross your needles, everybody.